Shopping for Big Lebowski Action Figures? "Nobody calls me Lebowski, you got the wrong guy. I'm the Dude!" Deluxe 12-inch action figure of The Dude from The Big Lebowski. Features multiple points of articulation and many accessories along with talking key chain! Entertainment Earth Convention Exclusive! He calls himself "The Dude." He's not a hero, he's just a man and a very cool one at that. Relive all the fun and excitement from the movie with The Big Lebowski The Dude Deluxe 12-Inch Action Figure from Bif Bang Pow!. This highly detailed figure features an incredible likeness of actor Jeff Bridges who portrays Jeffrey "The Dude" Lebowski in the classic movie. The figure has 25 points of articulation including posable arms, hands, legs, and more so you can pose "The Dude" to recreate your favorite scenes from the movie. 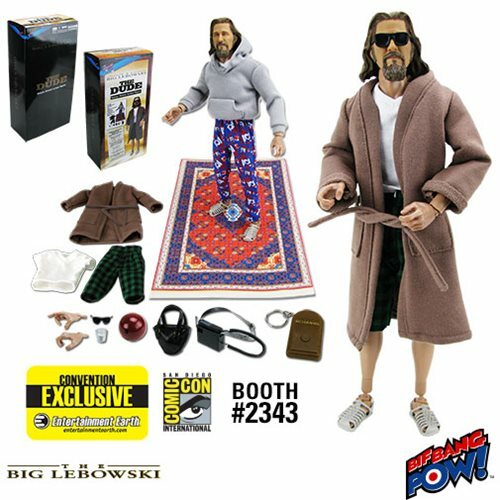 The Dude Deluxe 12-Inch Action Figure comes with interchangeable hands and movie-inspired accessories like the bowling ball, bowling bag, sunglasses, cell phone, White Russian, jelly shoes, two multiple piece cloth outfits, a talking key chain that speaks 8 popular phrases directly from the movie and of course the rug that really ties the figure together. And, making it a true collectible, the run will be limited to just 486 pieces, each individually numbered. "He peed on my rug!" "Man, if my f*ckin’ ex-wife asked me to take care of her f*ckin’ dog while she and her boyfriend went to Honolulu I’d tell her to go f*ck herself." "Careful man, there’s a beverage here!" "I’m sorry, I wasn’t listening. Ow! F*cking fascist!" "Oh, the usual. Hmm bowl… uh drive around. Uh, the occasional acid flashback." "Yeah well, The Dude abides." Complete with 3x AG3 batteries.